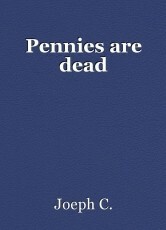 Pennies are dead, essay by Joeph C.
Pennies, the most cogitated coin throughout economic America. Pennies, the most cogitated coin throughout economic America. Several admire them. Several hate them. However the populace who admires pennies also admires poisoned dogs, tax increases, and losing track of their money. In effect of those reasons, America should exclude the penny. You (The Reader), may be asking yourself “How will the citizens of America transact to the populace $0.01 to $0.04?”. Which is an excellent question with an exceeded amount of answers. However, the correct answer is; you'll not, you round to the nearest $0.05, $0.10, or $1.00. Since prices went up the government could demote tax rate in your city in effect of your paying that tiny bit extra money would balance out the demoted tax rate. However, if America did not exclude the penny the market prices would not increase and the government would be forced to increase the tax rate so they would get an increased amount of money to stipend the workers. The financial problems with pennies are not the only reason America should exclude them. They weigh too much to logically be practical to pay with, so, instead of excluding the ability to pay $0.01 to $0.04 America would just enable that payment with the 70% of the adult population in the U.S that have debit cards. Therefore, only eliminating the coin itself. There is an exceeded amount perks as there are expenses for excluding the penny. The perks include an increase in zinc to produce batteries, less weight to carry, and fewer objects to keep track of. Comparatively, the expenses include goods and services will have an unnoticeable increase in price, and Lincoln will become less known for his coin. For this financial conception to be commonsensical, the U.S would need to round the price of goods and services to the nearest $0.05, $0.10, or $1.00. To ensure that you are not forced to pay anything in pennies the government will be forced to change the tax rate to 10% or 5% or any of their multiples where you live. The government would gain the most due to spending 1.66 cents producing a 1 cent coin, moreover, losing money. As stated in the threshold, pennies are the most cogitated coin throughout economic America. Now you (The Reader) know why. © Copyright 2019 Joeph C.. All rights reserved. Did I get my $ 100 back ? Other Content by Joeph C.